Welcome to The Boca Raton Tribune, where community news is available 24/7 and 365 days a year! Our mission is clear: We publish hyperlocal news. We care about our community and love to share the stories that matter the most to them. From local schools, non-profit groups, civic organizations, houses of worship, businesses, Boca Raton City Hall, and local sports, The Boca Raton Tribune welcomes all kinds of local stories. Our newspaper is 100 percent community oriented and public input is encouraged. You can contact us via email, twitter, facebook, or by giving us a call. The Boca Raton Tribune is printed weekly, here on Issuu you see the electronic version of that printed newspaper in full quality. 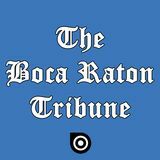 The Boca Raton Tribune is distributed free of charge and is made available to over 30,000 readers and to businesses throughout Boca Raton and the surrounding area. Welcome to The Boca Raton Tribune, we are your closest neighbor!